Sara: When I was New York last year, I fell in love with the number of salads bars around Manhattan. 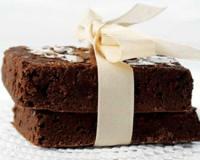 It was so that I did not have anything else for lunch or many dinners while we were there! The build your own salad bars had so many wonderful ingredients that I manage to have a different and delicious salad every time. 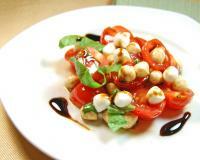 Salads are wonderful option for a light lunch and can be prepared easily. 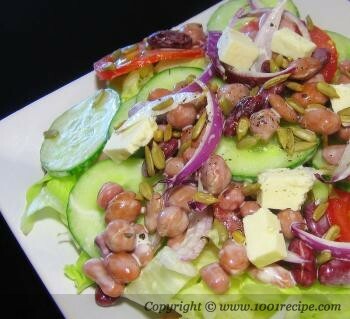 This one is a vegetarian salad but beans added to the salad provide the daily required protein. This is just a one version of my favorite salad recipes; hope it inspires you to try out as well. 1. Slice and mix all the vegetables. Add olives, cheese and beans and stir gently. 2. Sprinkle the sun flower seeds just before eating to keep them crunchy! 3. Add salt and pepper and your favorite dressing.